Posted on March 16, 2019 by Andy Higgs in Features, Flight report, Home. 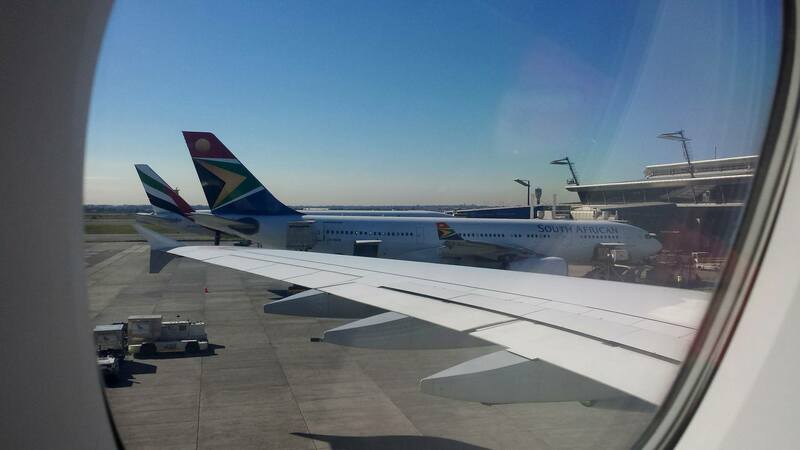 You may recall that I redeemed airline points last year when I took my first trip to Southern Africa. 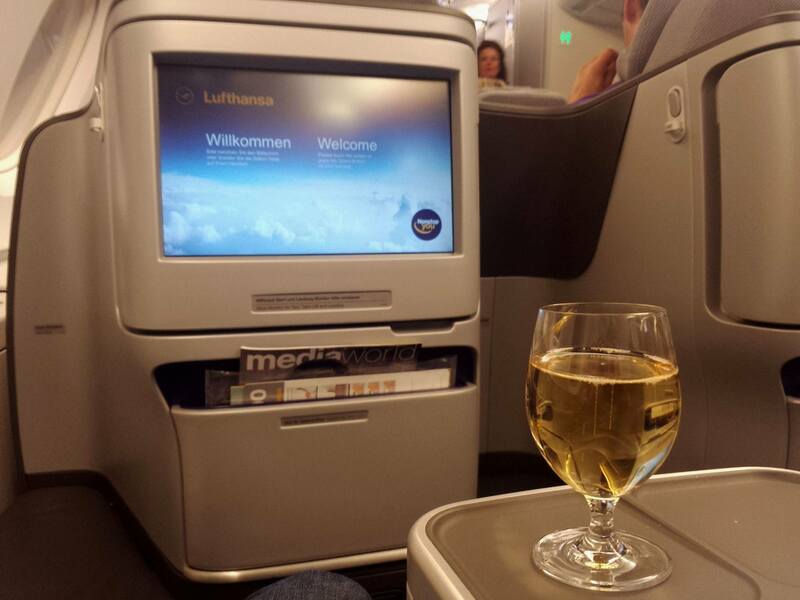 The long leg of that trip was on Lufthansa’s A380 monster from Frankfurt to Johannesburg and I enjoyed myself immensely, despite the fact that the aircraft had the old Business Class cabin. This year I needed to get to JoBurg once again and had enough United miles to burn on Business Class on the Star Alliance network. I had no problem finding availability out of Frankfurt and back into Munich for the intercontinental flights. 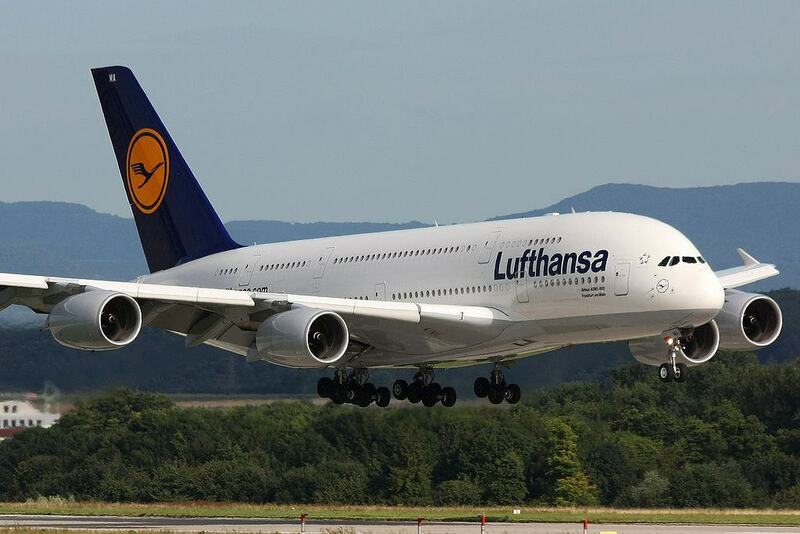 The long-haul sections would be with Lufthansa on the outbound and returning with South African Airways. 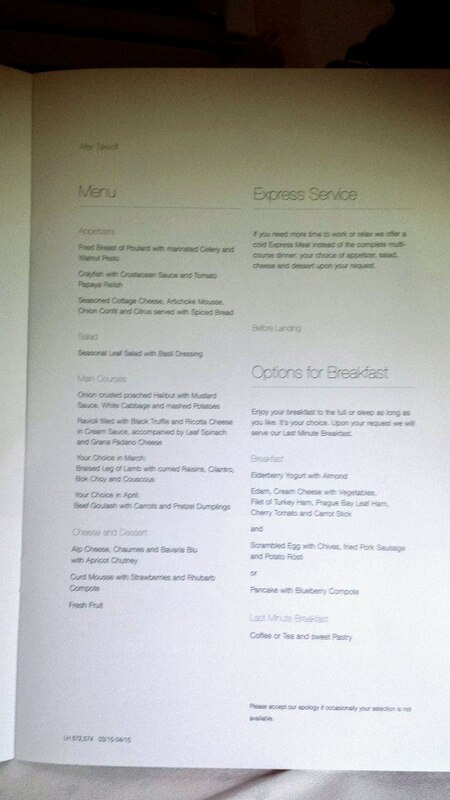 Despite recent devaluations by airline loyalty programmes – including United – and the fact that US Airways is now merged with American and no longer in Star Alliance, Europe to Africa in Business Class remains an excellent deal – I needed 110,000 United miles for the entire journey, with taxes and charges of USD 138 on top. I purchased the United miles at a 40% discount late in 2014, so all in all these flights came in at around USD 1800 – cheaper than Economy on the same airlines. Oh yes. So I was a very happy camper when I confirmed my booking in late January. But it was only in March that I suddenly remembered that Lufthansa was in the process of refitting its A380s with the same, lovely Business Class product installed in the 747-8. I had been following the process online last year but it had been months since I last checked on progress. 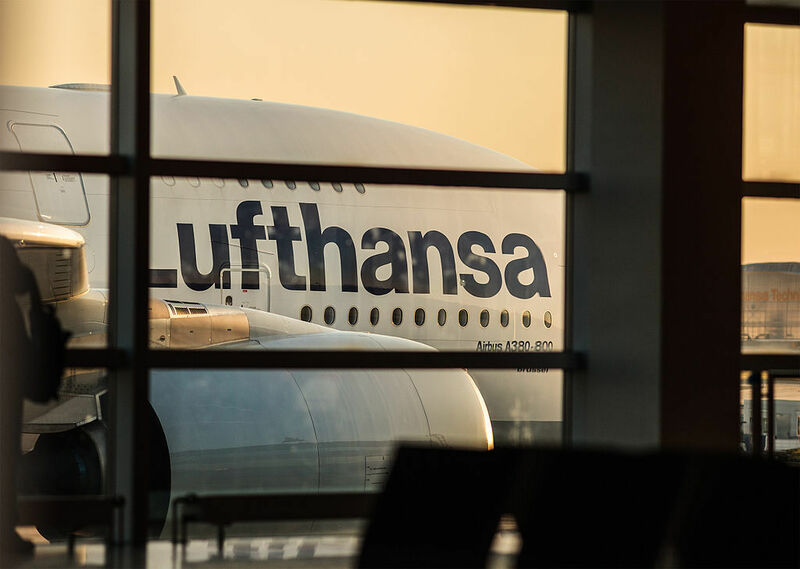 Using the German airline’s very handy website tool I was able to find out that the A380s on the FRA-JNB route had indeed been completed – so I would be travelling down in even more luxury than I had originally assumed. And that’s always good, right? Okay, without further ado let’s get into the flight report. Note that a lot of the details here are the same as last year so instead of covering it all again I’ll refer back to that article for more comprehensive information and just include any new or different observations here. This flight was the longest part of my journey to Botswana; the return journey from JoBurg to Maun was arranged and paid for separately as a cash ticket. The entire routing on this points redemption was as follows: Trondheim – Oslo – Frankfurt – Johannesburg – Munich – Copenhagen – Trondheim. Europe to Africa is a long way; you are looking at about 11 hours for a non-stop flight. This is way over my personal pain limit for Economy so as long as I have miles I will always try to redeem them for Business Class to avoid arriving like a wreck. Having said this, the lack of a major time difference makes travel to South Africa easier than to Asia or the Americas for those of us starting in Europe and I would of course fly Economy rather than Business if I was paying in cold hard Kroner. All in, my cash outlay for this was around USD 1800. A big jump from the USD 1000 I paid last year (and more so given the rise of the greenback) but still a huge bargain and actually cheaper than the same tickets in Economy on the United or Lufthansa websites. In the past I have tried to claim that I’m no aviation geek but in recent months I’ve come to realise that I probably have become one to some extent. I mean, you would have to be seriously blasé to find the fact that a 500 tonne beast like the A380 can fly at all uninteresting, surely? 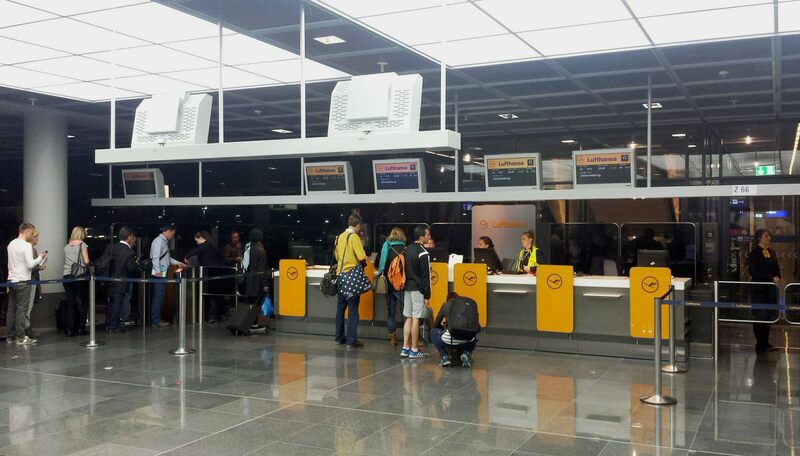 When booking my flights I made sure that I had a reasonable length of time at Frankfurt Airport. There are several reasons for this: it’s a confusing place at the best of times and you do not want to have to rush to your connection, believe me. 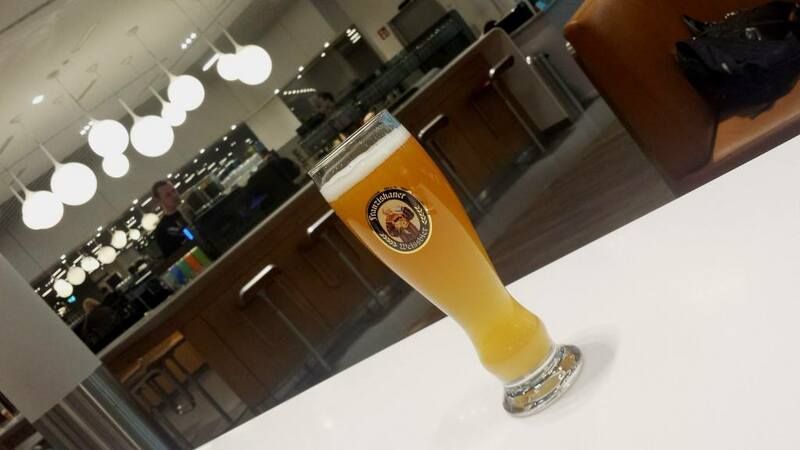 I also wanted to make use of the lounge, take a shower before the long haul and most of all be able to enjoy a cold German beer. Yes, you can pour a lovely Weissbier yourself. 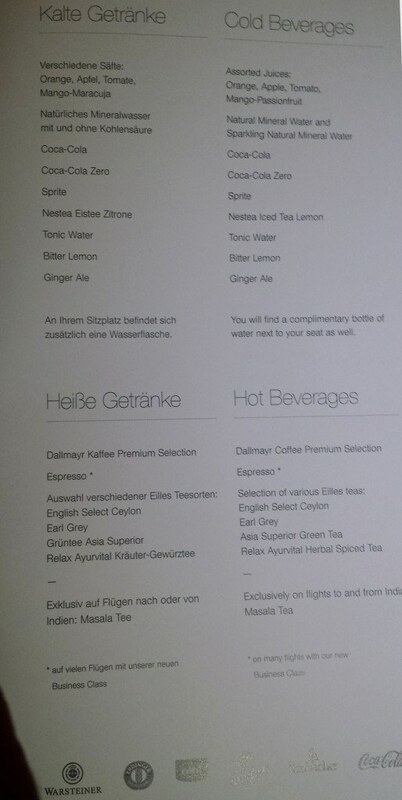 I used the same Z50 Business Lounge as last year (and a couple of times since) which has everything I need. By which I mean it has Weizenbier on tap. Oh yes and food and other drinks, working space, fast and free WiFi, power sockets and those lovely showers. A new addition to this lounge is a staffed hot dog stand. 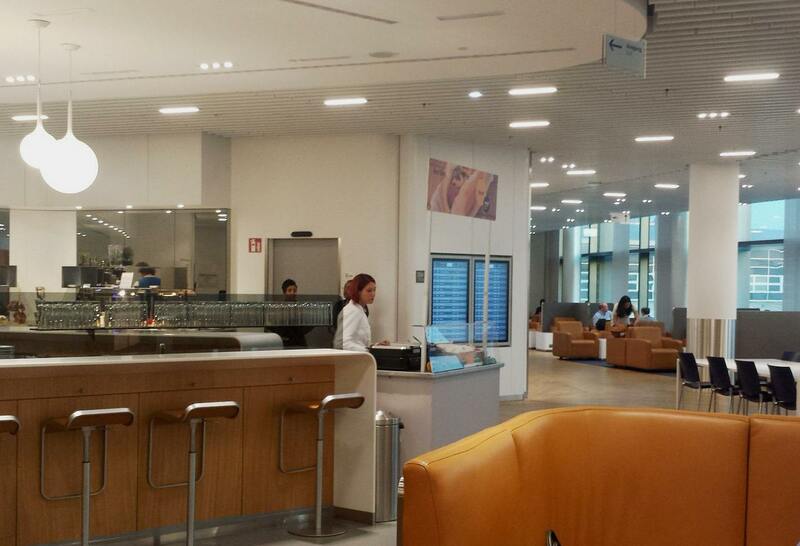 So yes, you can get a frankfurter in Frankfurt. If you can’t also get hamburgers in Hamburg I will be very disappointed with Lufthansa – this clearly demands investigation. One of the lesser-known perks of flying Business Class is that you can take two carry-on bags. Not one carry-on and a laptop bag, but two full-sized bags. This was essential with all the photographic equipment I was carrying (which filled one bag) and allows you to pack a change of clothes very easily. I always do this when flying long haul so that I can change after a shower, and I also bring soft track suit trousers to sleep in on the plane (unless I am flying First Class, when of course I use the pyjamas provided). Well, did I manage to pull that off? 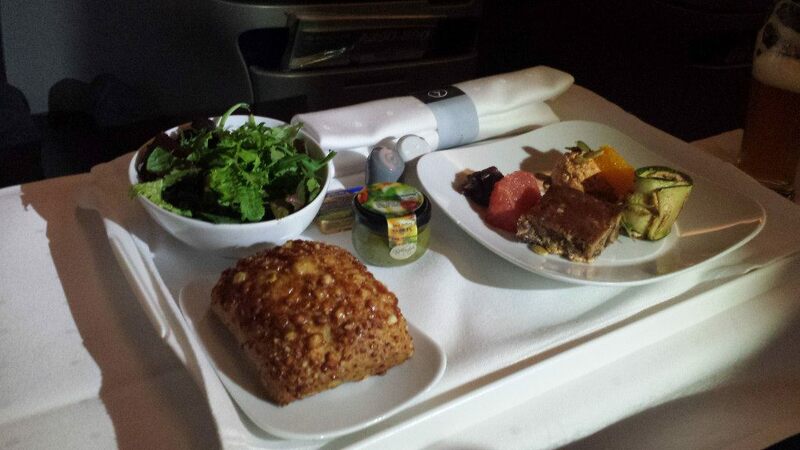 It did sound as if I regularly travel in First Class, didn’t it? Well, it may well be a LONG time until I do it again, but to see what you get in the very front of the plane, check out my flight with Thai Airways from Paris to Bangkok and the return journey back to Frankfurt. Pyjama picture included, so you are hereby warned. 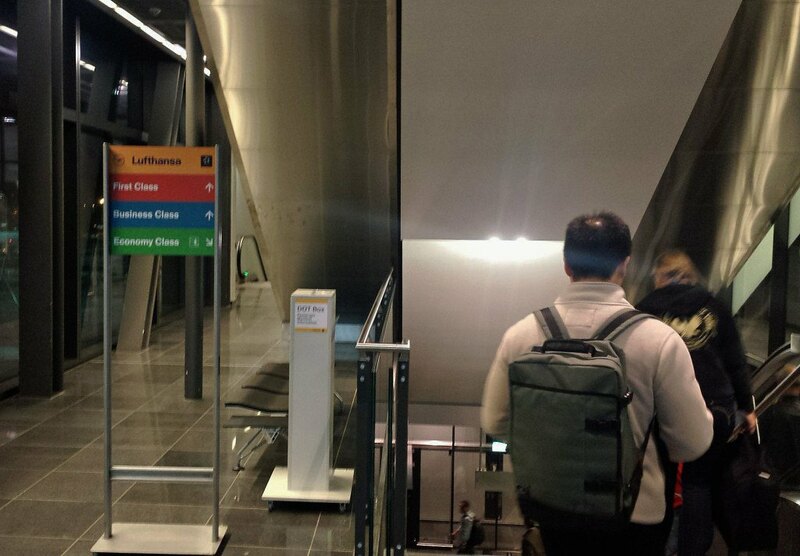 At about 2030 I made my way to gate Z66 – just like last year but instead of “Frankfurt am Main” my plane this time was “Munchen”. The flight was boarding when I got there and there was no queue at the Business and First Class line (on the right there) so I went straight through. 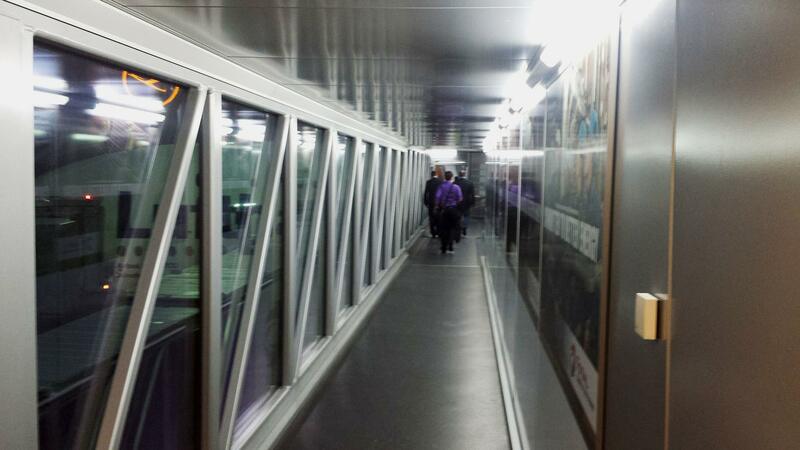 I followed the signs to the air bridge for the upper deck and was greeted on board by our crew for the journey. The cabin was immediately familiar with the same New Business Class seats that I had enjoyed from Frankfurt to Miami and more recently to Chicago and back. The amenity kit was pretty standard with eye shades, socks, a toothbrush and toothpaste, Nivea cream, and headphone covers. A pillow and blanket were waiting for me as well and I grabbed the unused pillow from my absent neighbour for a little extra comfort. Each seat has its own decent sized LCD monitor, operated with a wired handset or by using the touch screen functionality. 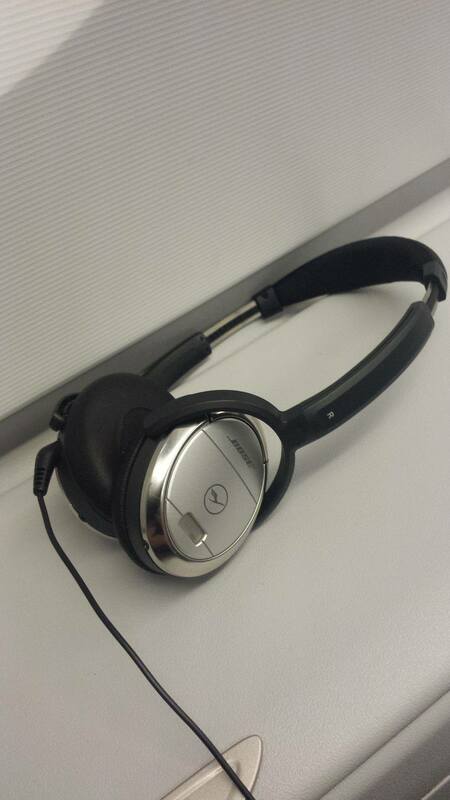 A pair of quality BOSE noise-cancelling headphones are provided. The entertainment system had a better range of movies and TV shows than I’ve seen on Lufthansa for a while, although there is a certain amount of luck involved. I haven’t been to the cinema for months so there were a lot of films I hadn’t seen but I settled on a couple of episodes of ‘Modern Family’ to start before something more substantial with my meal. Again the real-time footage from cameras on the aircraft’s nose, tail and undercarriage is better than a lot of the other offerings, at least until you are in the air and it’s too dark to watch. 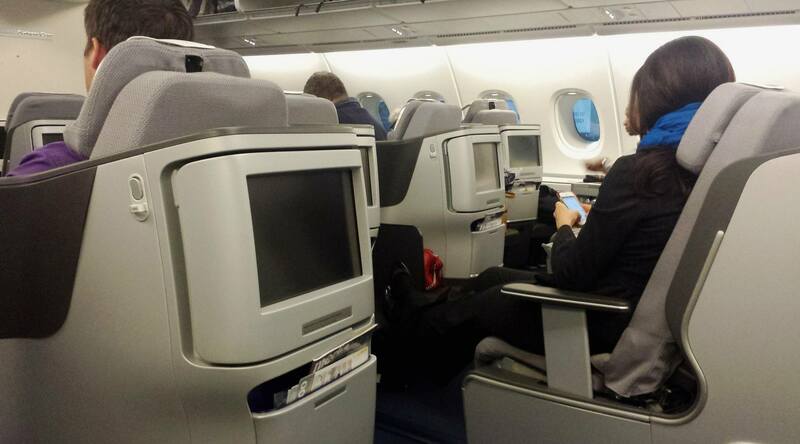 The seats have AC and USB outlets for powering up devices and of course a tray table in one of the armrests. I was offered a pre-take-off drink and naturally I accepted, toasting my flight with some German sekt. I can’t fault the catering – it was wonderful. I took a few more photos this time (I still find it awkward to do so but it was easier as I did in fact have an empty seat next to me). Apologies for the slightly blurry ones but I was rushing to get it done and the lighting was not ideal for snapping either. 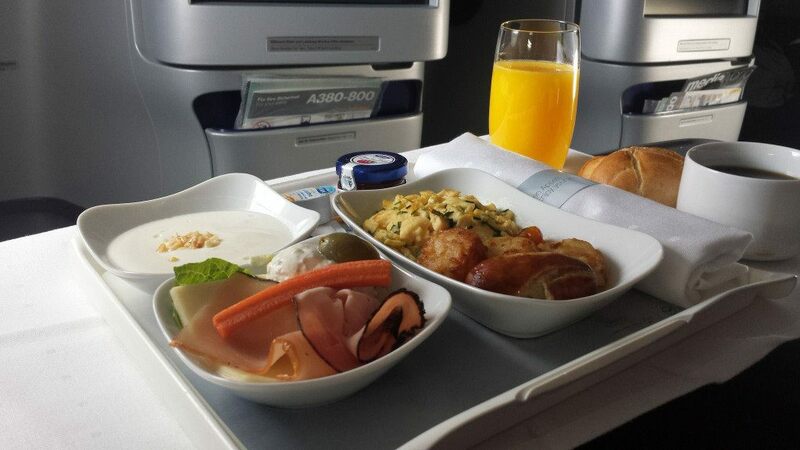 Us Business Class passengers were served a three-course dinner with drinks and dessert and then breakfast a couple of hours before landing. I recorded the appetizers for posterity but gave up after that. I chose the lamb and then of course had to have a good red wine – the Medoc fit the bill perfectly. Lufthansa will always get my vote with regard to beer as they serve not only Erdinger weissbier but one of Germany’s best lagers, Warsteiner, as well. While regular coffee is always good it was even better to be able to have a proper espresso. 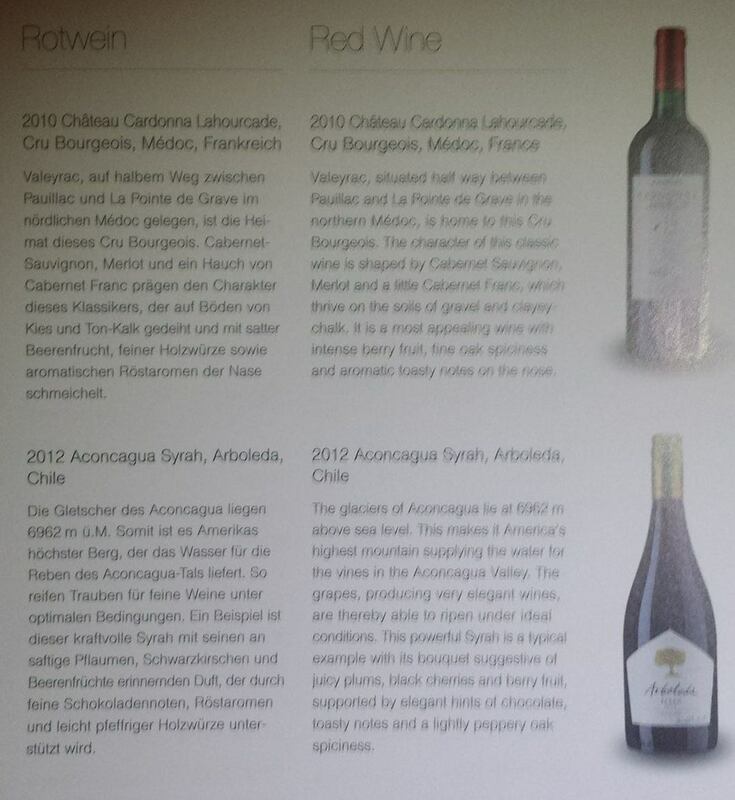 Since this is only available on flights with the new Business Class cabin I guess the machine is built into the upgraded cabin – whatever the case may be, it’s a welcome upgrade. In good German style the flight was on time and even though I have now flown the A380 a few times the smoothness of take-off and low noise level still amazes me – especially considering the size of the thing. Service was perfect, to be honest. Cabin crew were attentive, efficient and friendly. I slept for about five hours due to the combination of tiredness, good food and something like the perfect amount of alcohol. Breakfast was excellent too and after a quick wash-up and change we began our descent into Johannesburg. Landing was as smooth as take-off and it was – as always – incredibly exciting to be back in Africa. 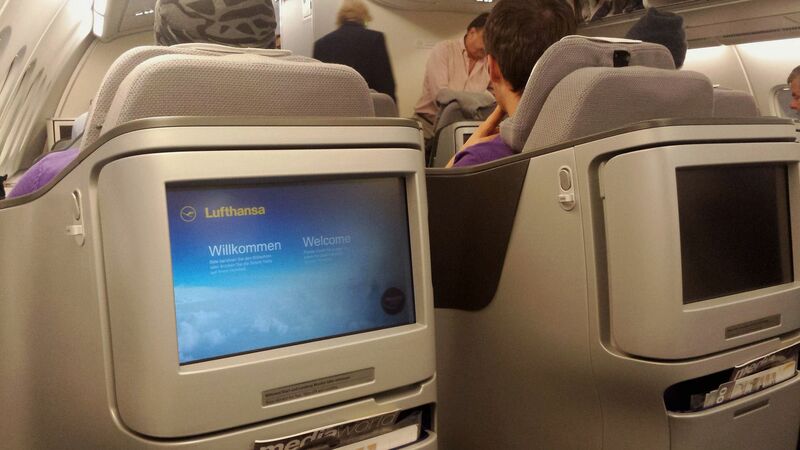 I love the A380 and for the money/miles Lufthansa’s New Business Class is one of the best ways to fly. This is perhaps one of the perfect long-haul routes too – plenty of time to make the most of it yet still get a good amount of sleep, and no jet lag to ruin it either. Unless you are lucky with a special offer (similar to the one we took advantage of when travelling to Miami) it is harder to justify the expense of a cash booking although it’s a splurge you’re unlikely to regret. 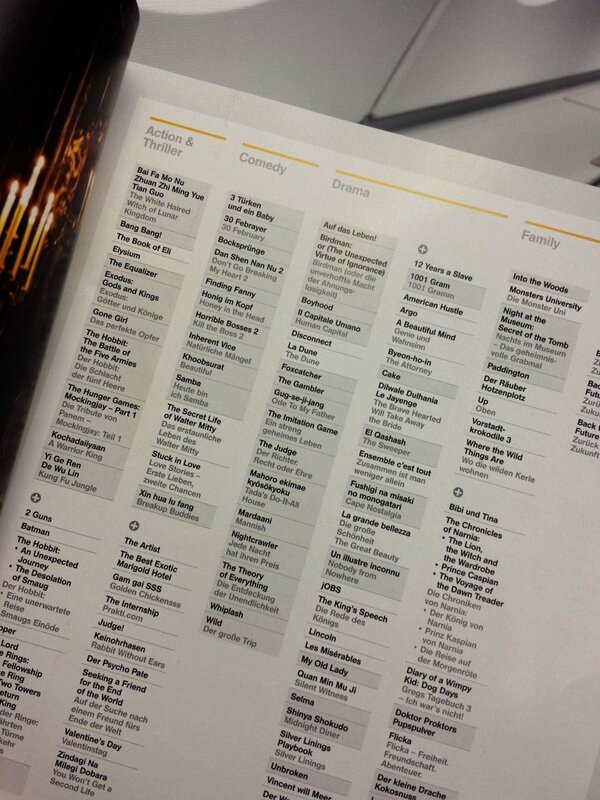 But for an award redemption I believe this route takes some beating. 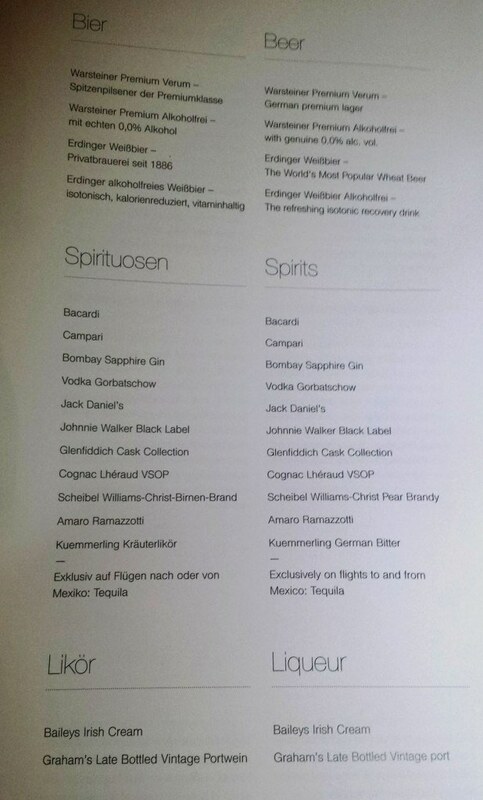 Lufthansa proved once again that the airline deserves its excellent reputation. Business Class configuration: 78 seats on upper deck in 2-2-2 layout.